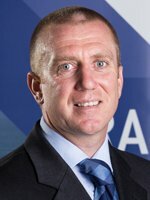 Michael Anderson joined Abu Dhabi Terminals in 2013 as HSE Manager, overseeing all health, safety & environment issues at Khalifa Port Container Terminal‎. Prior to this he worked at Murray & Roberts in Abu Dhabi and was part of the British Armed Forces for a considerable time. Michael is a Chartered Member of IOSH.